3M has utilized the latest in glare filter technology to create the world's best privacy screen ever. The screen frame looks just like our other frames but the glass appears jet black from any angle except from the computer operators view, hence, providing complete privacy, from others nearby. As a vision enhancement specialist, CRS LIght has selected the best available on the market today. These also fuction as Anti-Glare filters reducing 95% of glare for ease of reading. The 3M Privacy filters block up to 99.9% of ELF/VLF E-field radiation. Complies with HIPAA Privacy Rules. Notebook and LCD Privacy Filters are available as well, please call for pricing. 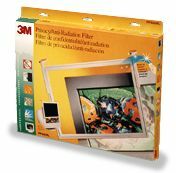 3M's flat frame filters fit virtually all monitors with 14" to 21" diagonals. The unique hangers, included with all flat frame filters, make attaching the filter a snap, even on curved monitors. The flat frame filters are available in several sizes, see the chart below. Reduce 95% of glare for ease of reading. The 3M Glare filters block up to 99.9% of ELF/VLF E-field radiation. Other sizes are available as well, please call for pricing. There is a sales tax charge in OHIO. If exempt in OHIO, please notify us and we will credit your account.